Latches close the container shut to prevent contents from falling out. Built-in handles & wheels at the base make traveling easy. Plastic construction is very durable and prevents damage to banners. 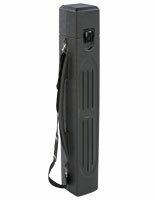 Plastic shipping cases are rugged enough for shipping, and light enough for carrying. Graphics can be up to 51" wide, and need only be loosely rolled to fit in the generous 13" interior diameter. 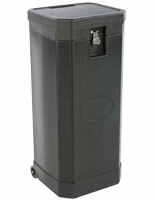 These plastic shipping cases feature heavy duty plastic wheels, and 2 carrying handles. Overall measurements are 55" high by 16" wide on the exterior. The actual weight of these plastic shipping cases is 20 lbs. 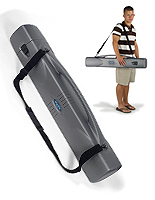 These tradeshow containers can easily be carryed by one person. 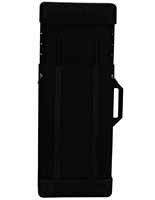 Those who attend tradeshows buy these plastic shipping cases to protect and transport such items as; banner stands, lights, signage and other components for their booths. The wheels and handles on this unit make it simple to maneuver the container through busy convention centers. The latches on these plastic shipping cases keep the unit shut and secured during transit. 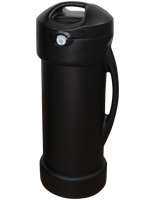 The matte black finish will hide any scratches caused by rough handling during transport. Don't trust your valuable documents to a flimsy bag. 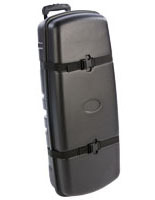 These plastic shipping cases are built with rugged materials that are made to last. Artists and photographers can also use these containers to store and transport large format pictures and artwork. 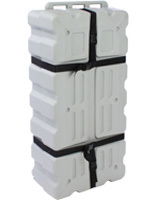 No matter what the need, these plastic shipping cases will protect and secure your valuable signage and accessories. There are also other sizes and styles to choose from in the main category. Buy one of these plastic shipping cases today! Please Note: The lid on this case is not hinged, you must unlock both sides before opening. It's a good case but I wish it was a little more durable. I'm not sure how long these should last. We bought this on a year ago. It has been shipped 5-6 times, once across country. The small plastic part holding the axle for the wheels is thinning out and the axle is very loose now to the point that I'm not sure I want to use it any longer. I do not want it to fall apart while I'm traveling. The case itself is dragging dragging (contributing to the thinning out of the plastic). There are not a lot of other options and for the price, it still might be a good deal. Just know it is not a forever case. Those will be at least double the cost to purchase and to ship. This case could be improved by adding larger wheels. Thank you for taking the time to send us this thorough and helpful feedback! We have sent it to the product developers to review. Additionally, one of our customer care specialists will reach out to assist. Thank you! Agreed. We have the 44" tall version and have the same issues. I would pay more for better wheels and better latches. Or even a cover that can be used when shipping or something. Anything to have it last longer than a year or two. 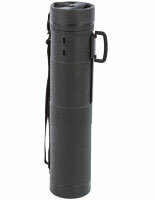 Posted 16 days ago by Leslie C.
This item came in fast and worked perfect for our banners and marketing equipment. I had shopped for a while for a new case to ship custom made screens to and from different locations. As our company ships numerous cases and bins weekly, I was looking for a sturdy case to protect these screens. Unfortunately, the first time being shipped TO a site, the top 1/2 of the case popped loose just enough to shift the 2 pieces apart. The closures had been bent so much by the strain of trying to keep the 2 pieces together, that it took an hour with a hammer, screw driver, and pliers to separate the lid from the base. I'm sure this is sufficient for local travel, but it's certainly not able to withstand any shuffling/movement in transit. We are sorry to hear that the product was not as you had expected, Charla. A customer care representative will contact you promptly. looks great and our product fits in there just fine. fast delivery too. This travel item was stated was 'airline' approved - which is misleading. This item cost me DOUBLE the actual cost of the item to ship 1 time - to/from the destination on American Airlines. The item size is NOT airline approved - and I would NOT recommend this item. Hi Kristin, We are sorry to hear about the issue you had shipping the graphics case.